I just got back from a beautiful trip to Croatia with Gerhard and the kids. It was so beautiful and so relaxing and of course I indulged in fresh figs and freshly shelled beans. This recipe I developed before we left and I didn’t manage to finish to writing the recipe, so here it is now with some delay but I’m positive you can cook this for another month using local produce. Into the fall you can use really ripe tomatoes and if you don’t find fresh beans dried ones are perfectly fine. The only downside is that you need to soak them and the cooking time is longer. This summer has been probably the hottest summer I’ve ever experienced in Vienna or for that matter anywhere where I can remember. For the last 3 weeks the temperatures have been over 30 °C and even as high as 37 and 38 degrees. No need to say that I haven’t been keen on cooking. Mostly I’ve been making gazpacho and tabbouleh and the likes trying to leave the stove and oven off as much as possible. This dish is an exception and I made it when the temperatures weren’t quite so exalting. 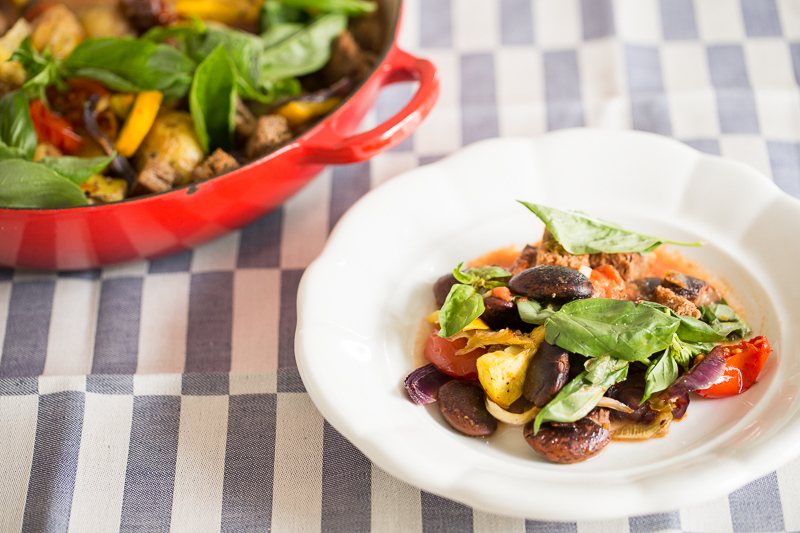 It is perhaps a summer version of a bean stew that I adore eating during the winter and cooler months. This dish combines three things that I could eat anytime and they can conveniently be eaten separately if you double the amounts: First beans cooked to perfection, second a delicious tomato coconut broth or soup which utilizes the juiciest, ripest summer tomatoes and a nice dose of heat from chili and finally sourdough croutons which act as a kind of panzanella component. The croutons with a fresh tomato salad make the ultimate summer bread salad and are one of my favourite dishes. Summer can be challenging for the creative cook. There is so much wonderful produce that ideas are overflowing and I almost never have enough time to try out everything that I would like to. Sometimes its just the simplest of fare that really excite me the most. A perfectly ripe tomato with basil and olive oil can hardly beat anything. That with a nice crusty bread and I am in heaven. 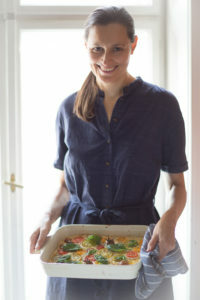 My children however require more substantial meals and I am always trying to create a balanced meal for their young growing bodies and am sometimes concerned about whether they are getting all the nutrients that they need. Considering how much junk food I ate growing up I guess I should relax and take it easy. It has probably never been easier than now to eat a balanced diet and yet there is so much conflicting information out there about what we really need the most. Since I’ve always been an advocate of eating as much vegetables as possible I don’t think you can ever eat too many vegetables. As for other types of foods, I noticed that I need some sort of protein in all my meals in the form of either beans, flax seeds, chia seeds or nuts so I try to eat at least one of these things in each meal. This dish incorporates scarlet runner beans with roasted vegetables the aforementioned tomato coconut broth and lots of fresh basil.The most time consuming part is soaking the beans overnight. Everything else comes together quite quickly. You can also customize this dish to whatever you happen to have at home. If you have cauliflower or sweet potatoes you could use those, basically any vegetable that lends well to roasting. 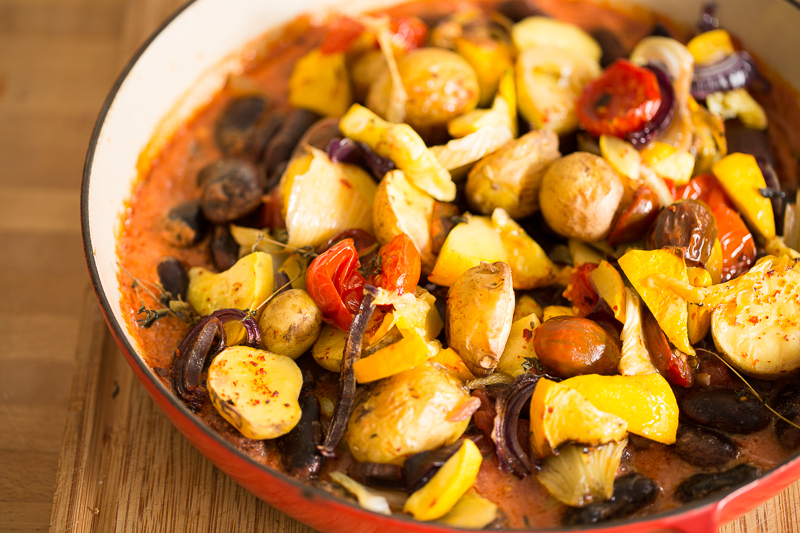 I used a combination of young potatoes, juicy and sweet cherry tomatoes, peppers and young squash. This time of the year is the best time to use young summer squash or otherwise known as zucchini. When they grow a little bigger they become too watery for my taste and the texture is also very rubbery. I love the yellow variety now and I mostly find it at my local farmers market.Try shopping at farmers markets and avoid supermarkets if you can. Local, organic produce is superior in taste and affordable and you are supporting local farmers who need our support. I noticed the difference especially with my children who normally are not enthusiastic zucchini eaters. When I made the ones from the farmers market they ate it with delight and now even request it. Eating in harmony with the seasons is also something that takes time but is easy to adapt and so much more enjoyable. You take time to celebrate the wealth of what nature has to offer and your body thanks you as well. If you grow your own vegetables then I don’t need to convince you of anything. I am simply envious of anyone who has a garden. Living in the centre of Vienna in an apartment on the fourth flour I can at most grow my own herbs but because my apartment is so hot if I don’t water them every day they are dead within a week. Gardening in my own garden is one of my biggest dreams and picking my own berries. Oh well, enough of that. So before we move on to recipe I would like to share some thoughts about cooking beans. In Vienna it is rare that you’ll find fresh shelled beans but if you do have this luxury do make use of this short season and once you’ve shelled them, freeze them for later use. I mostly use dry beans so this is what I mostly have experience with. Soaking is essential and also removes phytic acid that can only be released by soaking. Another important component is the aromatics you use and not using too much water. This way the end result is a very flavourful broth and creamy, perfectly tender beans. Beans can be also cooked in advance and when you want to use it as a component of a grain bowl or whatever you simply store the leftovers in the fridge. In my case a pot of beans usually gets eaten in one sitting because my family just love them and also happen to have very healthy appetites. Needless to say, they will not go to waste and you can use every last drop. I hope you explore the wealth and beauty of cooking and eating beans. They are so good for you and also so nourishing and can be really delicious once you know how to prepare them properly. For me there is something meditative about cooking in general and with beans you can explore this aspect as well. Soak the beans in plenty of water overnight. I put the beans in a large glass bowl. The next day drain and rinse the beans in put them in a pot with rosemary, chile, bay leaf, garlic 1 1/2 teaspoons of salt. USe a large pot because the beans need space to expand. Cover with 10 cups of water. They should be covered by 2.5 cm. Bring everything to a boil then immediately reduce the heat and adjust so that the beans are simmering gently. Cook with the lid ajar until the beans are halfway soft. This will take up to an hour. They should be quite dry and crumbly. At this point add another teaspoon of salt and a glug of olive oil. Now you want to check every so often to see if they are done. They should be creamy and soft but not falling apart. Some will inevitably split. This is fine. When you think they beans are done remove them from the heat and let the beans cool in their own liquid. This step makes the beans perfectly tender and they absorb more of the aromatics added at the beginning and of course the salt. You can add another glug of olive oil now. Now you are ready to use them in whatever application you please. 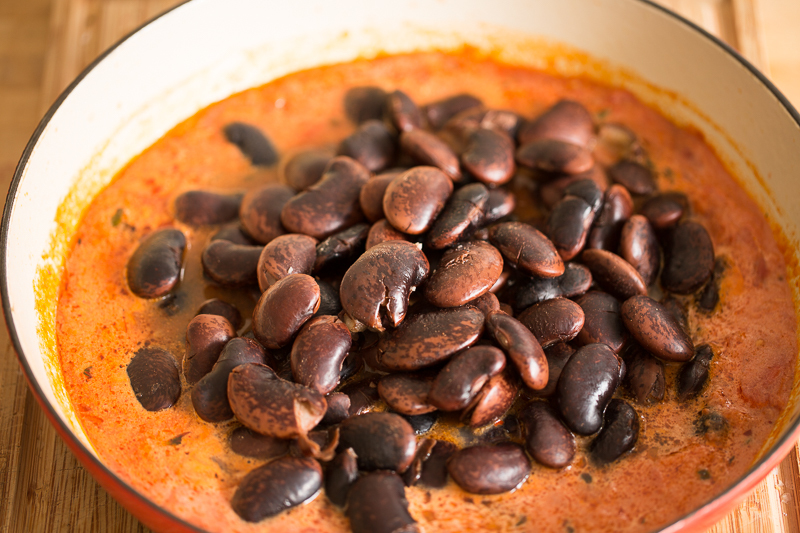 The bean cooking liquid can be used in stews and can be saved. Heat one tablespoon of olive oil in a pot and add 2 chopped onions and cook until translucent. Add 2 cloves of chopped garlic and chopped ginger to the mixture and saute for another minute. Add roughly chopped ochs heart tomatoes and add salt to season and simmer for 10 minutes. Next add the can of coconut milk and simmer for a couple of more minutes. Season with salt and pepper and taste. Check the seasoning and add more salt or pepper if necessary. Remove from the heat and transfer to blender and puree until smooth. Set aside. 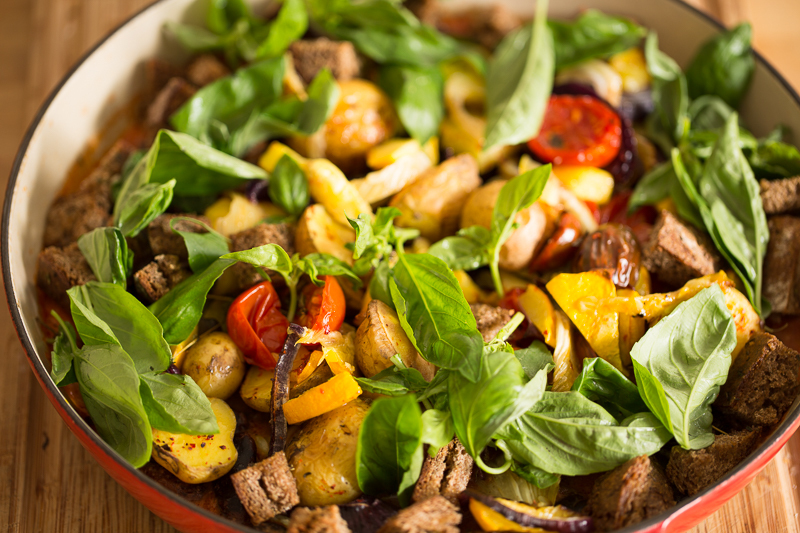 Place the potatoes, cherry tomatoes, red onion and peppers on a baking tray and slice the remaining garlic in slices and scatter over the veggies. Season with salt and pepper and a generous amount of olive oil and bake for 30 minutes at 200 ° C. Remove form the oven while you make the croutons. Cut the slices of bread into cubes or tear into small pieces. Heat some olive oil in a pan and toast the croutons for two minutes on each side or place on a baking tray and toast in the oven for ten minutes. Place the beans in the tomato coconut broth and cover with the roasted vegetables and croutons and scatter fresh basil over the top. Serve immediately.